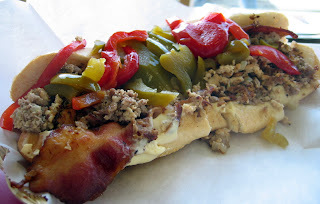 This is Giao's 3 meat heart-stopper with bacon, chicken and beef. 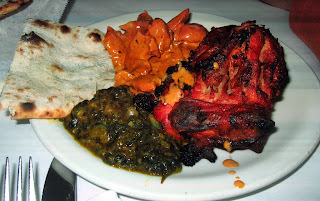 We were house-hunting in Rockridge and walked quite a ways on College Ave looking for lunch before we found something we had an appetite for that day: an Indian buffet. The chicken tikka was good, as was the naan. The chicken tikka masala was oddly flavorless. The saag was alright, but not the best around. 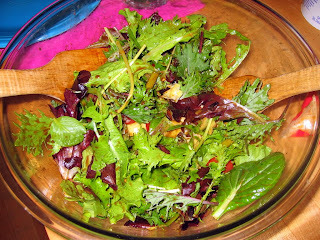 Simple salad of fresh mixed greens from our Two Small Farms box and marinated artichoke hearts dressed in a homemade balsamic vinaigrette. Italian fajitas sounds weird, but it was really quite tasty. 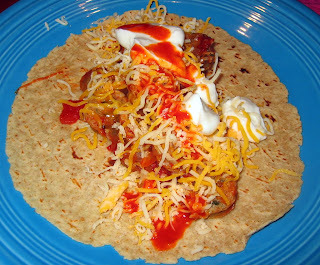 Basically, we sauteed about 8 sliced chicken sausages with sliced onions, a can of diced tomatoes and some pine nuts, then used that as the fajita meat, topping with cheese, greek yogurt and hot sauce. This was all wrapped in a whole grain tortilla. The spigarella is an Italian heirloom green that is a but bitter, and stands up well to meat. Toast the pine nuts in a dry pan until browned. Add a bit of olive oil, then the greens and sautee until tender. Season with salt, pepper and lemon. 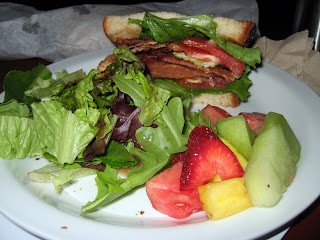 Alexis smashed together the insides of the BLT between 1/2 the bread and ate what amounted to an inch thick of bacon. It was exactly what you would expect it to be. The fruit salad was not bad either. I don't know how much this cost because it was catered in at work. This dish was simple and quick, but I'd go easier on the garlic black bean paste next time, as the agretti was a little salty. Sautee the garlic in a bit of olive oil until just beginning to brown. Add the shrimp and season. Cook until just done, then spritz with the lemon juice. Sautee the mushroom caps in a bit of olive oil until tender. Set aside. In a large sautee pan, sautee the onion in a bit of olive oil over medium heat until beginning to color. Then add everything except the mushrooms and cover. Steam the agretti in this manner until tender, stirring occasionally. 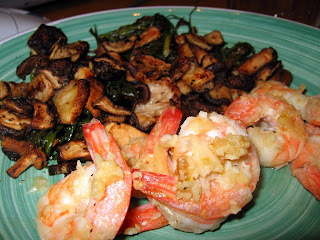 Serve garnished with the sauteed mushrooms. 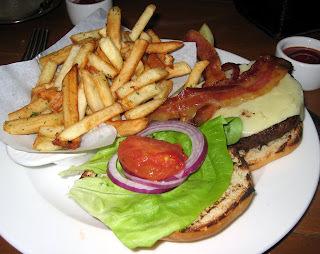 It was our friend's birthday, so we took him out for a late lunch at Town Hall, a semi-upscale place that's home to the best burger. 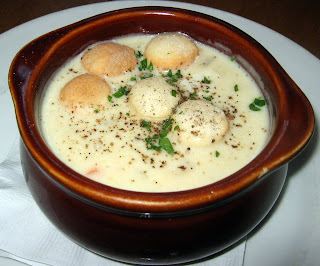 Smooth, creamy and chock full of seafood, we were pleasantly surprised by this soup. Super simple. Super Succulent. Full of flavor. 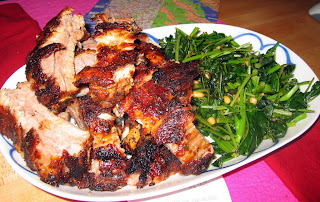 Grind the caraway seeds and mix with the salt and pepper to create a dry rub. 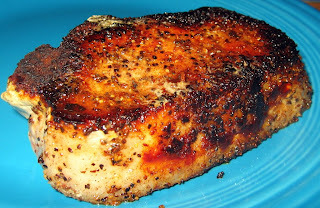 Rub the pork chops all over with the mixture. Pan fry on medium heat until done, flipping once. Simple and satisfying. 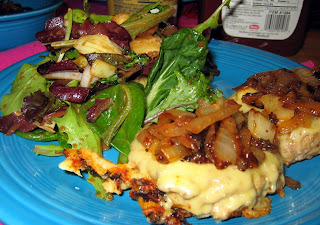 These turkey burgers were pretty healthy, especially when served with a hearty green salad. Mix the meat and spices thoroughly with your hands. Form into patties. Pan fry over medium heat for a few minutes on each side, until almost cooked through. Then top with the sliced cheese, cover and steam for about 1 minute, until the cheese melts. Sautee the onion in a bit of olive oil over low heat for about 45 minutes, until completely carmelized. Top the cheese burgers with the onions. 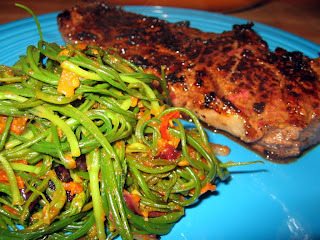 This was a simple dinner made with our newfound favorite veggie, Agretti. The steak was very simply seasoned with steak seasoning and worcestershire, then pan fried to 3 minutes on each side over medium heat (for medium rare). Sautee the onions in a little olive oil until soft, then add everything else and cover. Steam, covered, for about 5 minutes, then uncover and sautee until agretti is perfectly tender and all water has evaporated.